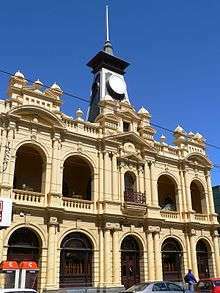 Collingwood is a suburb of Melbourne, Australia, 3 km north-east of Melbourne's central business district. 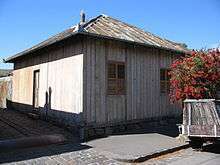 Its local government area is the City of Yarra. At the 2011 Census, Collingwood had a population of 6,467. The Collingwood Australian rules football Club (the Magpies) has a history dating back to 1892 as an incorporated football club. They were once housed at Victoria Park. In recent years they won the 1990 premiership and the 2010 grand final rematch against St Kilda. In 2011 Collingwood had a population of 6,467. 54.0% of people were born in Australia. The most common countries of foreign birth were Vietnam 5.8%, New Zealand 3.2%, England 3.0%, China (excludes SARs and Taiwan) 2.2% and Ethiopia 1.5%. 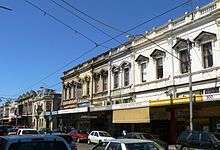 Collingwood has many buildings listed on the Victorian Heritage Register and several notable commercial and public buildings. 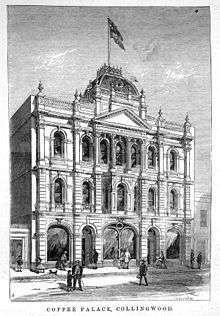 Yorkshire Brewery, built in 1880 to the design of James Wood, with its polychrome brick and mansard roof tower, was once Melbourne's tallest building. For many years it has been subject to development proposals and the heritage stables were at one stage demolished without a permit, however the site remains neglected. Despite its name, the Collingwood Children's Farm is in the neighbouring suburb Abbortsford. ↑ Australian Bureau of Statistics (31 October 2012). "Collingwood (State Suburb)". 2011 Census QuickStats. Retrieved 21 June 2012. 1 2 "VICTORIAN HISTORY.". The Argus (Melbourne, Vic. : 1848–1957). Melbourne, Vic. : National Library of Australia. 15 October 1909. p. 9. Retrieved 26 September 2013. 1 2 Barnard, Jill (25 February 2010). "Collingwood". e-Melbourne. School of Historical Studies Department of History, The University of Melbourne. Retrieved 25 September 2013. ↑ Hardy, Frank (1950) Power Without Glory, Random House. ↑ Monash University (November 2004). "Collingwood, Victoria". Internet Archive Wayback Machine. Internet Archive Wayback Machine. Archived from the original on 15 June 2005. Retrieved 1 September 2012. ↑ Stark, Jill; Craig, Natalie (24 January 2010). "Spring Street tap dances, fearing the Tote could rock the vote". The Age. Melbourne. ↑ 3CR 855 AM (2012). [http://www.30 million.org.au/3CRstory "The 3CR story"]. 3CR Community Radio. 3CR 855 AM. Retrieved 1 September 2012. ↑ Richard Watts. "Gay & Lesbian Melbourne" (PDF). Lonely Planet. Retrieved 21 December 2008. ↑ Editorial (29 May 2007). "Gay conundrum". The Herald Sun. Retrieved 21 December 2008. ↑ AAP (28 May 2007). "Gay pub defends 'straight' ban". Melbourne: The Age. Retrieved 21 December 2008. ↑ Steve Dow (30 May 2007). "Don't lock out the heterosexuals". Melbourne: The Age. Retrieved 21 December 2008. ↑ "Contact Information." Madman Entertainment. Retrieved 29 March 2010. ↑ "Map of the Ward Boundaries Archived 2 June 2010 at the Wayback Machine.." City of Yarra. Retrieved 29 March 2010. ↑ "Australian Dictionary of Biography". Patterson, John Hunter (1841–1930). ↑ "Australian Dictionary of Biography". Duncan, John Cowan (1901–1955).